As perhaps one of the most competitive and rapidly developing fields in the Irish film industry, the category honouring the very best of Irish Animation is becoming more highly contested with each year’s nominees. 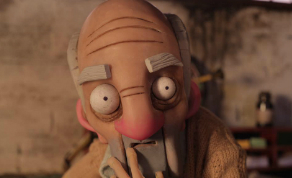 One such nominee is ‘Second to None’ writer/director Vincent Gallagher, whose stop motion project follows Frederick Butterfield’s journey with jealousy and ambition, when his twin brother becomes the oldest man in the world. The project is produced by Damian Farrell, with production design from Aoife Noonan and the vocal talents of Morgan C. Jones. Other projects nominated for Best Animation are ‘The Lost Letter’ (Kealan O'Rourke), ‘Don't Forget the Bread’ (Gary Gill) and ‘Define Intervention’ (Sean Cunningham). IFTN: Firstly talk us through your own introduction to animation; when did you know you wanted to work in this field and where did you study? IFTN: Your ambition seems to match Frederick’s in your director’s statement: ‘It was my idea to show that ambition can drive a person to desperation if all they crave is fame and success. I also wanted to show how the simplest approach can often be the best, but I wanted to show it by choosing the most complicated way to animate a film.’ Can you tell us firstly how you became drawn to this theme and secondly what attracted you to stop motion? “Working in any creative industry there will always be a certain amount of competition. It's easy to get caught up in what other people are doing and you can end up measuring yourself by their successes. I'm sure we've all been on both sides of that at one point or another, and I found that fascinating. I had read an article about someone becoming the world's oldest man and it struck me that there could be a dark competitive element to even that accolade. “The moral of the film is to follow your own path. Success and accolades are great and all, but you need to focus on what you are doing, carve your own path. Sometimes you're a Frederick and sometimes you're a Herman, but if you just focus on doing good work and not on what others are doing, that's the best way to be happy. IFTN: How and when did the Irish Film Board get involved? IFTN: Given how meticulous the project is, how did you break down your time in terms of creating each element, filming and then working through elements such as sound in post-production? “One of the most important elements in animation is the animatic; it's your blueprint for the film. We storyboarded everything and then I cut the boards and added sound effects, which allowed me to shape the film and really hone the pacing and comedy beats. Because of my live action background there were a couple of times where I rewrote a scene as we were going. In stop motion, doing this means you have to physically make anything new you think of. Luckily I was working with a great production designer, Aoife Noonan of Bowsie Workshop, and she was incredibly quick but equally meticulous. IFTN: What is the next Vincent Gallagher project we can expect to see and how do you feel this IFTA nomination will impact your career, going forward?